Join the discussion on our forums! Come discuss Giant Anaconda over in our dedicated Giant Anaconda discussion topic. My Giant Anaconda don't want non if you ain't got buns hun! What a ridiculous scenario that would never happen. No one would voluntarily trade into this thing without expecting the summon effect to take place, or else why would they run the card at all? Almost a year later, this card has seen no play, because it’s the opposite of a life saver. I imagine that was supposed to be Arcane Giant. Also, it's a good thing that you used the Mind Vision after the snake died, eh? Anacondas don' have venom nor venom-fangs. Giant Anacondas do. Tru story. Maybe not, but they DO have minions with 5 or more attack inside of them. Turn 5 this + Innervate into Deathwing, Dragonlord into a whole bunch of dragons from my hand = gg. This card is actually very good against Heroic Grim Guzzler. It can trade with several of Coren's minions and pulls out a big minion in your hand that you couldn't have played otherwise. This is a good card. Haters gonna hate. It's 3 hp makes it look crap, but it's actually an advantage, it has a very strong deathrattle. Deathwing, Dragonlord becomes a 1/12 against paladin or they put up cheap taunts and tempo you out, or frost bolt it and leave it alive......it's high hp works against it. either good, or trash. could pull out a Sated Threshadon or a Charged Devilsaur, but if it pulls out Volcanosaur or Tortollan Primalist, trash. yea no not rly gonna see play, doesn´t fit with the Druid quest if you draw it later on, which is the only Deck that would play this?! but rly depends how hard the Druid quest is to pull off, but with the new 3' 4' drops with 5 attack it seems pretty dam easy, so druid almost should finish the quest by turn 7 anyway, so you don´t care about mana anymore cause you will finish your Turns with 8 mana anyway if your Hand is empty. so why not playing a Fen Creeper instead? So this is basically a lategame Voidcaller that can pull any of your lategame threats and nothing crappy if you build your deck right. Hmm. 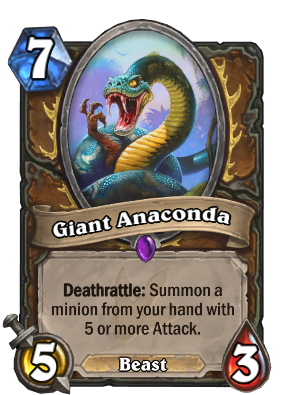 To me anyway, "Snakecaller" is a bit too phallic, but the idea is there. Yeah it's like voidcaller, but like... It's seven mana. Why not just play the bigger minion and instead of this run the shellshaper dude?